In the late 1950s the USA's fleet of transport aircraft contained outdated planes with piston engines, such as the C-118, C-121 and C-124. The newest was the C-133 with turboprop engines, however the military authorities wanted to acquire jet-powered transcontinental cargo aircraft, as the US military presence in various conflict zones around the world necessitated quick delivery of military supplies to distant countries. In 1960 there was a competition to design such an aircraft, the winner of which was the Lockheed firm. Designated the C-141A, its first flight took place in 1963, and in 1965 airplanes began to flow to the military from the production lines. At this time the war in Vietnam was already running high, and the USA had to speed large amounts of equipment there for the army. The situation was critical as well because C-133 machines had been taken out of service at the same time due to structural fatigue. Initially 132 machines of this type were ordered, and later their number was increased to 284. The project was very ambitious - more than 12,000 engineers and others in more than 1,300 plants in the USA and Canada took part in it, more than 5,000 people from just the Lockheed firm being involved. One of the significant limitations of the first production model was the relatively small volume of its cargo cabin: although capable of lifting 32 tons, the aircraft could only accommodate a 22 ton payload. 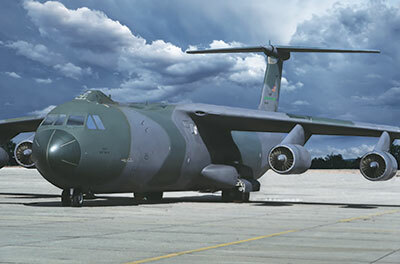 This prompted Lockheed to make changes to the design, and so 271 C-141A aircraft were converted to C-141B configuration. The rebuild continued from 1977 to 1979, when these machines were returned to active service, which lasted nearly 20 years. The capacity of the design, which was significantly strengthened, was doubled. The C-141B took part in Operation Desert Storm in 1991, but it was their last major operational use. Structural wear took more and more planes out of service, and they were replaced by the new C-17. The C-141 is remembered since for having one of the lowest accident statistics from flight incidents. Additionally, a number of world aviation records were achieved with it - dropping a parachute landing platform of 15,900 kg, and lifting cargo with a total weight of 31,800 kg.